Never has a nation funded a foreign spy organization’s efforts to catalog potential intelligence assets, operatives and, at the same time, take over the job of watching themselves. This is one of the greatest intelligence coups in history. Combine this with control of America’s airport security and total control of America’s communications networks, everything, mobile, internet, even landlines….we might as well pull down the flag and roll over. 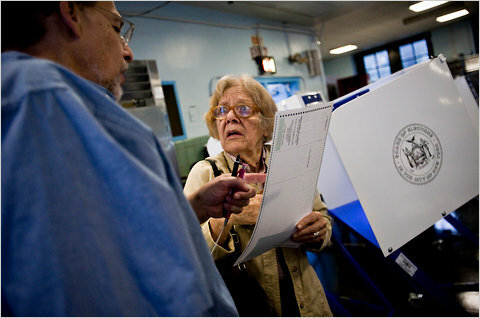 Voters around New York State stepped into the brave new world of electronic voting machines in Tuesday’s primary elections amid complaints around the city of longer-than-usual delays and troubles with the scanners that are supposed to swallow and tabulate the new, SAT-style ballots. A 170-page manual explaining step by step how to molest children which police in Orange County, Fla., believe has been circulating there for months, is not illegal. Investigators have stated that they still want to know where it came from. The manual, which was apparently written by someone who calls himself "the mule," is a how-to of child molestation, even explaining where and how to find potential victims, the station reported. Two former workers at one of the two Iowa egg farms implicated in the massive recall of salmonella-contaminated eggs said federal inspectors who worked at the two farms ignored complaints about conditions at one of the sites, the Associated Press reported Friday.